For the past two weeks, I feel like I have been jet setting around the country: New Orleans, Philadelphia, Atlanta. While some little part of me wishes I had been on some elaborate vacation, what I was doing in my opinion was so much better. So what could I have been doing that is better than a vacation? 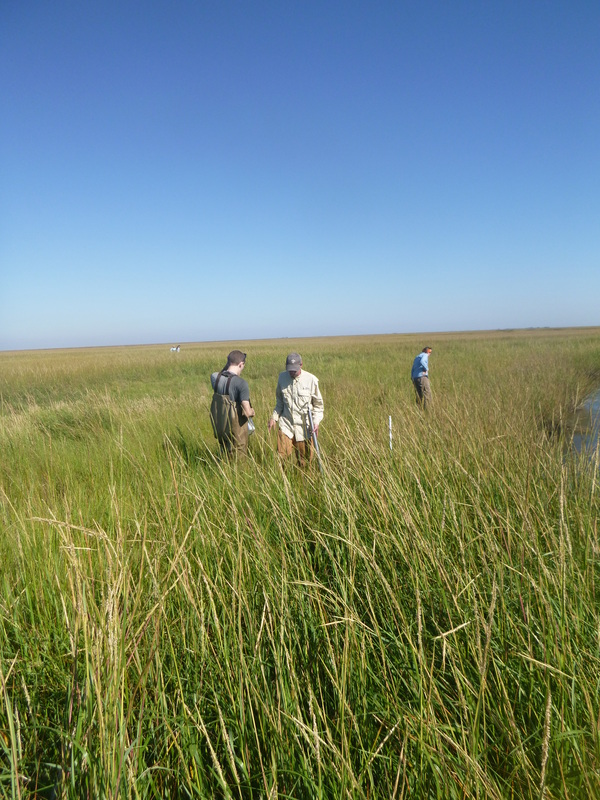 I was working with scientists from a variety of institutions from around the country to try and answer questions about the impact of the 2010 Deepwater Horizon oil spill on marsh food webs in the Gulf of Mexico. Now to some people that may sound terrible, but to me it was fantastic. Not only was I able to go into the field and do what I love; I was able to interact and learn from prominent scientists in my field. As I sat back to reflect on the last two weeks (as exhausted and crazy busy as I felt), I would not give them up for anything in the world. My time in Louisiana and New Jersey with members of the Coastal Waters Consortium were invaluable experiences and I realized how lucky I have been to be involved with multiple scientific networks and exposed to large scale collaborations so early in my career. To me, collaboration seems to be the circulatory system of science. This may seem like a silly analogy but without your veins and arteries (collaborations) to bring blood to all your vital organs (different disciplines of science) you cannot survive. Collaborations are necessary to build a career in science. No one can do everything on their own! Collaborations allow scientists to answer a multitude of interesting and relevant questions that span a range of disciplines. Collaborations allow us to discover and use new techniques and do large scale studies that mat be impossible on ones own. For students and postdocs, collaborations allow you to network with senior scientists and even colleagues at the same stage in their career that may become friends and potential collaborations in the future. These meetings of the minds can be both productive and fun! There are many types of collaborations from 2 scientists working together to large scientific networks. These large networks are becoming more and more prominent in modern science. As I said earlier in this post, I have been lucky to be involved with a few: the Coastal Waters Consortium (CWC) and the Zostera Experimental Network (ZEN). Both of these networks are comprised of scientists conducting research to come to one common goal. Another similar type of research network is the Long Term Ecological Research Network (LTER) which work together to compile long term datasets to understand environmental change. There are also data analysis and synthesis networks such as the National Center for Ecological Analysis and Synthesis (NCEAS) and Socio-Environmental Synthesis Center (SESYNC). These networks bring scientists of similar disciplines together to do large scale meta-analyses. Whichever type of collaboration you may do or be a part of they can only help you grow as a scientist. So the real question should be, “why should we NOT collaborate?” Because let’s be honest, two heads are definitely better than one. Tags: collaboration. Bookmark the permalink.